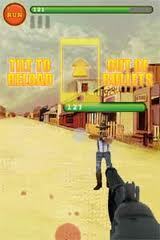 Howdy Cowboy, get your Gunslinging buddies for this Wild West Shootout! This fun game is free and expertly uses the accelerometer, where you go from a stance (your iPod/iPhone is pointing down) then you quickly whip it up at take aim. You control everything from the aim to how many bullets you reload by. So face off an opponent with your trusty revolver. You level up by earning gold which you can then go on to buy new guns (revolvers and rifles), aids – like a bit of whisky to make the pain go away, clothes and haircuts to accessorize your guy. It’s quite an adrenaline packed game for an iPod! Good luck! « Portal 2: Create your own Test Chamber!